Performers include: Barry Williams, Christopher Knight, Mike Lookinland, Maureen McCormick, Susan Olsen, Eve Plumb, Erika Scheimer, Lane Scheimer, David E. Smith, Larry Storch, and Jane Webb. 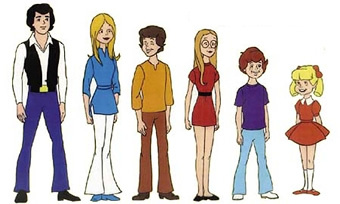 This animated series is a direct spin-off of the successful Brady Bunch sitcom. Filmation Associates along with Sherwood Schwartz, creator and producer of The Brady Bunch, adapted the series especially for Saturday morning television. The popular theme song of the original series is updated with a different beat and lyrics. The three Brady boys are still Greg (Barry Williams, later Lane Scheimer), Peter (Christopher Knight, later David E. Smith), and Bobby (Mike Lookinland). Their sisters are Marcia (Maureen McCormick, later Erika Scheimer), Jan (Eve Plumb), and Cindy (Susan Olsen). Brady parents Mike and Carol, and Alice the housekeeper, aren’t included in the show but there are some new characters to accompany the kids on their adventures. The Brady kids have a new dog called Mop Top (Larry Storch) and a twin panda cubs named Ping and Pong (Jane Webb). Marlon (Larry Storch) is a very smart, talking red mynah bird who’s also a wizard. He spins his tailfeathers like a helicopter instead of using his wings to fly. Marlon uses his magic to help the kids but frequently causes more problems than he fixes. Episode 22 — Who Believes in Ghosts? We haven’t been able to locate details this particular episode. First aired: October 6, 1973. Though the Bradys have continued in many series and specials, the specific aspects of this series aren’t part of them.